- Mexican Tres Leches Pancakes - Four buttermilk pancakes layered and topped with creamy vanilla sauce, and then finished with a drizzle of Dulce de Leche caramel sauce (Tres leches literally means "three milks" and typically refers to a cake soaked in three types of milk: evaporated milk, condensed milk, and heavy cream; IHOP's version seems to count the buttermilk in the pancakes, the creamy in the sauce, and the milk in the caramel sauce). - Belgian Dark Chocolate Mousse Pancakes - Four chocolate pancakes embedded with chocolate chips and layered and topped with a creamy Belgian dark chocolate mousse, and then crowned with chocolate chips. - English Sticky Toffee Pancakes - Four buttermilk pancakes filled with crunchy English toffee and layered with salted toffee mousse, then topped with salted caramel sauce and crunchy English toffee. 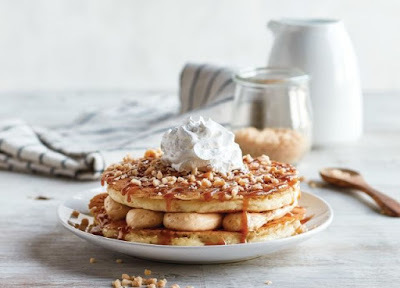 The seasonal pancakes can be found at participating IHOP restaurants nationwide for a limited time. You can order them on their own or as part of a breakfast combo.